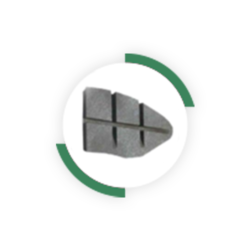 Flertex friction materials are fitted to a wide range of railway applications and are homologated by the main market players. To serve the railway market in line with its evolution, Flertex channels its technical expertise towards pad/disc friction pair concept to develop products which not only offer competitive life cycle cost but also are environmentally friendly. Flertex offers a range of brake shoes according to different market standards, K type, L and LL type in various shapes (UIC and AAR). These products are used in metro, locomotives or high energy applications such as high speed TGV. We work continuously on developing new materials with advanced technical properties to address the customers’ needs and offer more cost effective products.